We have a question, is it still a drone if you are inside of it? Doesn’t that just make it a helicopter? Semantics aside, there is no doubt that passenger drones are coming. 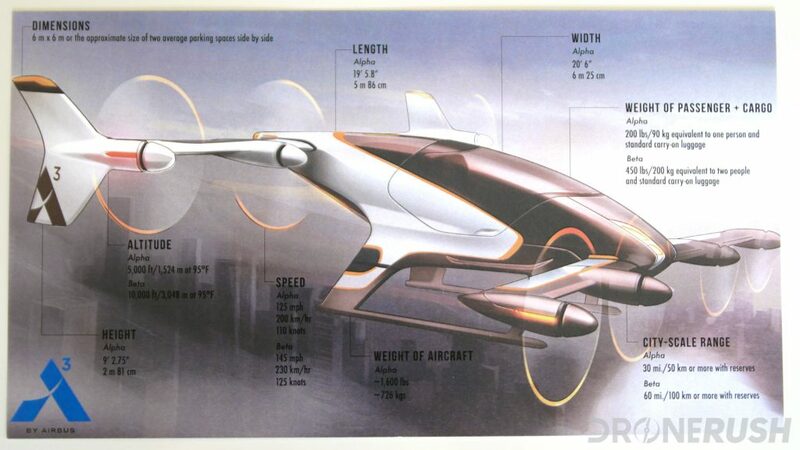 We’ve heard of drone taxi services in theory, now let’s see who’s building a flying pod for you. The big race at this stage of the game is to be the first to market. eHang was supposed to be one of the first, flying in Dubai, but legal and safety testing have delayed the ambitious start date. This means that the race is still on – let’s see some contenders. As you might imagine, there is a lot more to a passenger drone than just making a large scale version of the toys we fly at home. If nothing else, the size of the craft will exceed the maximum 55 lb legal limit for unlicensed craft to fly in the U.S.
At this size, and once hauling a passenger, the drone becomes, for all intents, a normal aircraft. This designation requires a different level of radios and sensors on-board, and, technically, a trained pilot at the helm. These next few stages of legal obstacles will be interesting, as manufacturers seek to put autonomous drones into the air. These drones will just happen to have a, presumably, untrained passenger. Sounds like a safety nightmare, but it’s not as bad as you might think. The systems to operate autonomous vehicles at this level of commercial application are vastly different than the interference accepting systems for our hobby drones. Don’t get me wrong, the basics of most modern hobby drone obstacle avoidance and self navigation are up to the task, it’s the bigger picture we’re talking about. Integrating sUAS into the airspace is fairly easy, fly below 400 feet and stay away from airports. These two things alone will eliminate 95% or more of possible drone to airplane collisions. But a passenger drone, being an aircraft, will need to operate in the upper airspace. This is where those extra radios and sensors come into play. Enough theory of the difficulties manufacturers face putting passenger drones into the sky, let’s see who’s playing the game. We attended a presentation by Airbus earlier this year, they are building one and two passenger drones now and testing them in my home state. The Vahana drones are being built by a break-off group from the main company, utilizing the best that Airbus has to offer in terms of experience, tools and materials. We were given no expected timeframe to see these drones in action, but they were insistent that they will be able to get you across town for nearly the same price as a taxi on the ground. Utilizing existing aircraft infrastructure, these drones will not show up on your doorstep. Head on down to the local hospital or similar helipad and soar away to a helipad near your destination. Why build it from scratch when you can just buy it ready to rock? Boeing skipped a few hard steps in the process by purchasing Aurora Flight Sciences, now they are all but caught up in this race. If you were wondering, Boeing has been very active in the drone space. I hope you have not seen one of their machines in action, with most of their efforts in the military space. Some spin-offs have seen civilian work, like the fire fighting efforts of Insitu, again here in Oregon. The Aurora purchase brings autonomy smarts more than drone smarts. We eagerly await more info on this project. We know Aurora Flight Sciences has done some fun stuff with DARPA, can’t wait to go for a little flight ourselves one day. We encountered a monstrosity at CES 2019, the very shiny Bell Air Taxi. 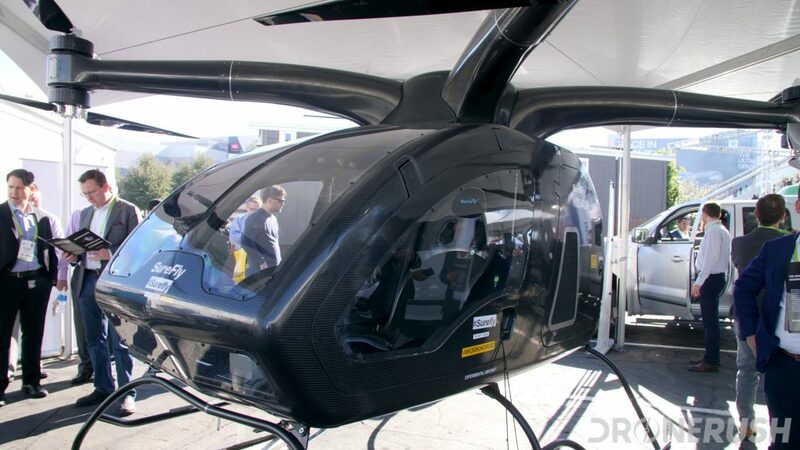 I could sum it up by calling it a luxury helicopter that just happens to be more of a VTOL drone design. It’s not a stretch to accept this type of craft from one of the largest manufacturers of helicopters, it’ll be interesting to see what their business plan is for this machine. We mentioned that eHang is possibly the closest to market, right? Their machine, the 184, has been around for a couple years now, and is in full testing in Dubai, expected to roll out to drone taxi operation at any time. 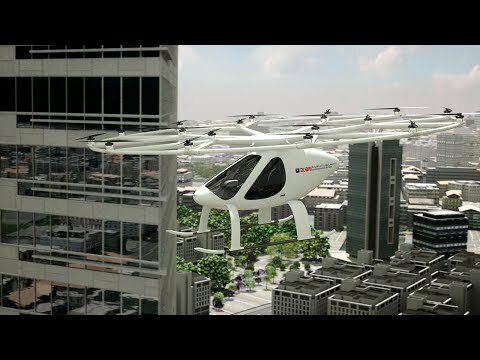 The machine now has competition, mind you, as Dubai is very eager to be the first city in the world to offer flying taxi service. While eHang is hard at work getting ready to fly customers in one of the richest cities of the world, we’ve heard rumor they are in financial trouble. It’s not easy inventing a new industry. We hope they come through. 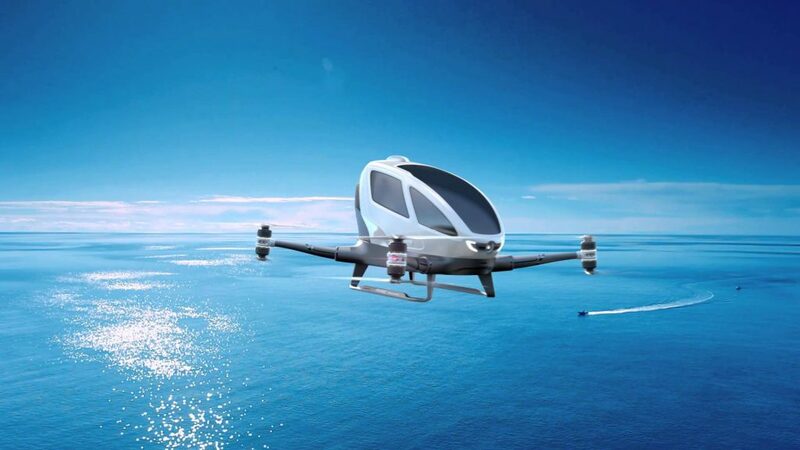 The German company Volocopter has a passenger drone already licensed for flight. 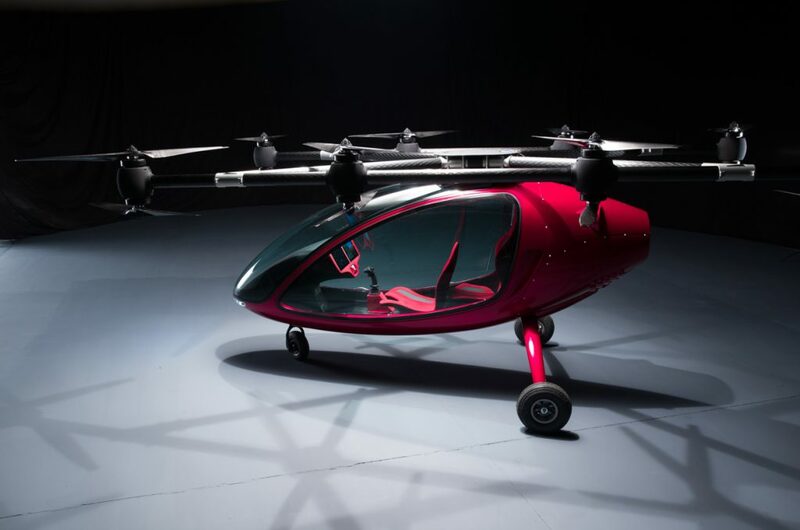 The E-volo looks like a tail-less mini helicopter with a large circle framework holding multiple propellers instead of just one. Once again in Dubai, this drone took its first test flight in September, 2017. As far as soaring the skies of the UAE, it’s really a tight race between eHang and Volocopter. Instead of the risks of a quadcopter design, two passengers will launch skyward by 18 propellers. We like the safe thinking. I may have to rethink the title of this article. Nah, I’ll go with it. Passenger Drone is a company making passenger drones, and their purpose is straight up for drone taxi services. They will offer piloted and autonomous flights in their two-seater craft. There is little to say about these guys for now. Stay tuned for CES 2018, we’ll visit them and we understand they’ll be making some announcements at that time. 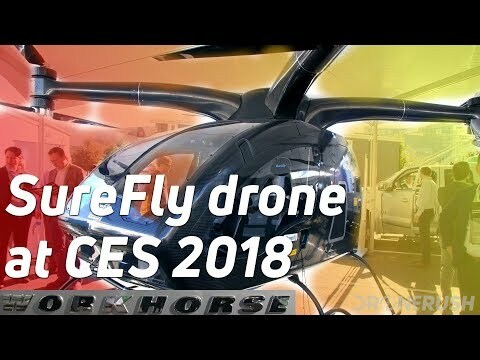 We met with the folks behind the Surefly passenger drone at CES 2018. We had a great interview with them (which we’ll publish as soon as we can,) talking about the build of their craft and the future and difficulties of manned-unmanned flight. This is a carbon fiber drone with steel landing gear, it has battery powered electric motors, but a full time gas powerplant that is constantly charging the batteries on the go. There are two seats and they are currently limiting payload to 400 lbs. So a guy like me can fly with a small child and suitcase, maybe throw lunch in there. Oh well, greater capacities should pop up as the technology progresses. KittyHawk has two passenger drones in the works, the personal Flyer and the multi-seater Cora. Neither are ready for general consumer purchase, but you can order a Flyer already, sort of. The Flyer is equipped with ten propellers, and it is a floating machine. We’ve never seen it land in or take off from water, but all of its operations are over water, thus far. We understand it weighs 250lbs and can handle near that much again in passenger weight, but that is not confirmed as yet. 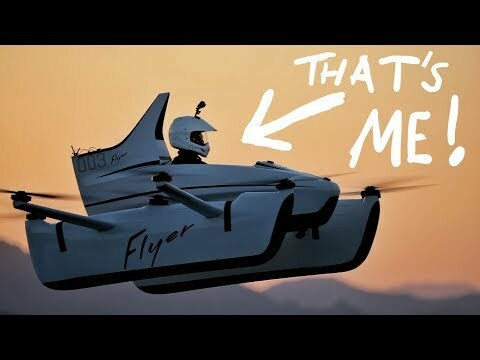 Enjoy this fun clip of Casey Neistat getting to fly the KittyHawk Flyer. 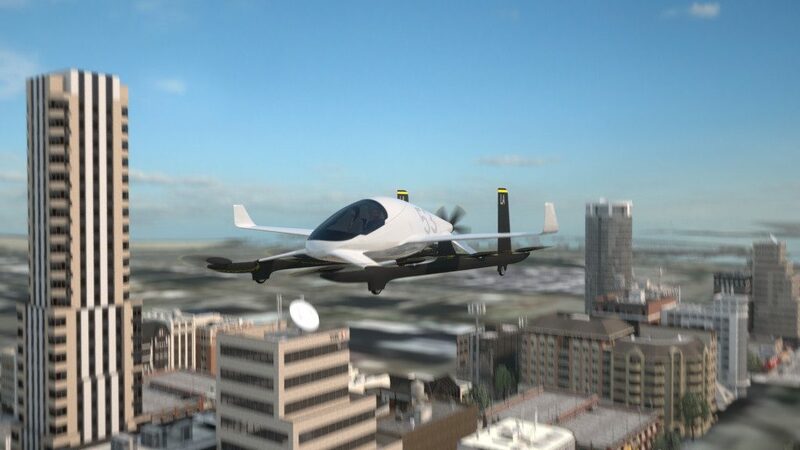 The drone taxi service market is not yet a thing, but so close we’re dreaming of it. The technology is ready, but the legal systems and safety for passengers and people below have a long way to go yet. 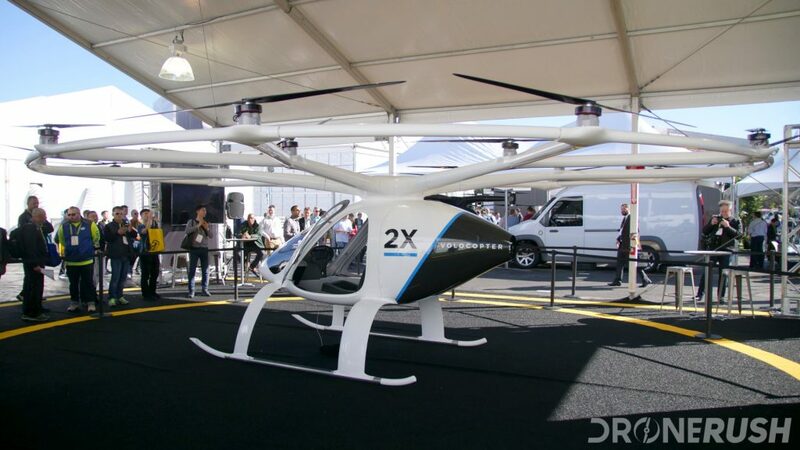 I do not expect to see drone taxi service in the United States until 2020. Let’s hope I’m wrong and we get to fly sooner. Also, this is not an exhaustive list, there are other drones out there than can carry people, hit the comments if you know of one you want on this list. 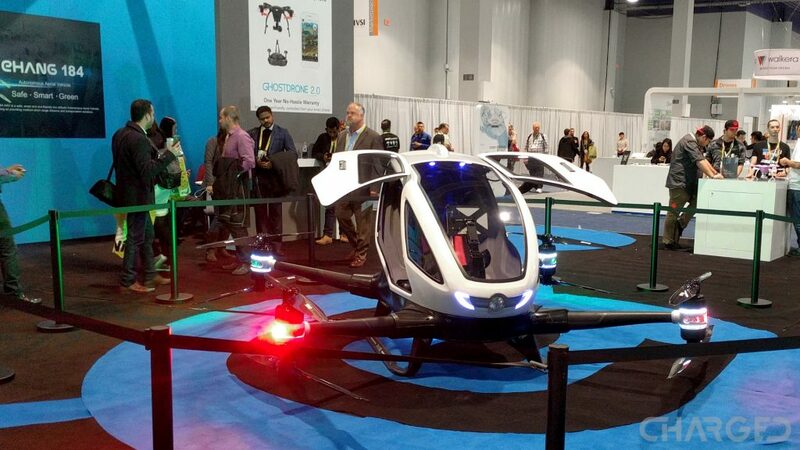 Will you go for a spin in an autonomous passenger drone?